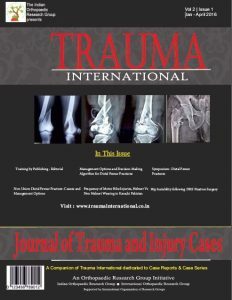 Trauma International – Unique Journal of Trauma and Injury is a peer-reviewed journal being published under the aegis of the Indian Orthopaedic Research Group (IORG), an organisation dedicated to promoting Academic research in India. Trauma International is started with an idea of a journal that will be international, intelligent, interactive and at the same time clinically relevant. The editors welcome submissions from all over the world. The stress is on latest research in the field of Trauma and Injury including emergency care, orthopaedic and surgical care, clinical and radiographic outcomes, surgical techniques and implant design, biomechanics, and biomaterials. All aspects of case of injured will fall within the scope of the Journal. There are two main reasons;  To produce a body of literature that is clinically relevant and to make this knowledge freely accessible to all. Journals have shown trend to move towards a more rigid framework of scientific publications, meanwhile losing the focus that Journals are meant to directly influence and improve patient care. 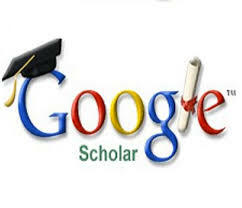 Charging for downloading articles imposes another limitation on dispersion and use of knowledge. Trauma International intends to counter these two issues by creating a journal that is intelligent, interactive, and clinically relevant and at the same time completely open access. 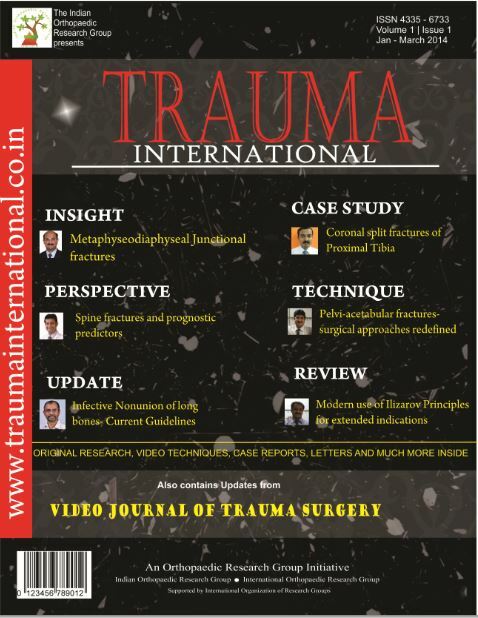 Trauma International will be a quarterly (4 issues per year) print and online journal. The online version will be an open access source and the print version will be made available on subscription. The journal publishes original articles, systematic reviews and meta-analyses, instructional lectures, case reports, technical notes and letters to the editor. Trauma International accepts following category of articles. Detailed description of new technique or improvisation of an old technique. Small surgical tips and pearls are invited for this section. Pictures are essential and video will be preferred.